Lien Chieh Machinery (LCM) has a long history of manufacturing industry leading Hot Forming Presses suitable for the forming of metals and composites. Hot Forming Press Machines use both high pressures and high temperatures to shape metal into a given shape. Hot forming can also be used to perform a range of functions including cutting, blanking, and riveting, making it ideal for use in the production of components for the automobile, shipping, and aviation industries. As one of the world’s leading Hydraulic Press and Press Makers, we pride ourselves in our wide range of products and exemplary design techniques. 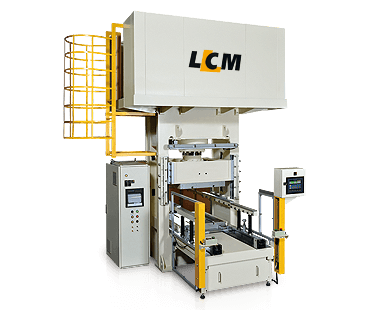 LCM also offers two different types of Hot Forming Press, the Tire-Tread Hot Press and Hydraulic Hot Press. The latter uses a specially designed eight-point gib system that enhances accuracy and stability. Furthermore all our Hydraulic Forming Presses use the very latest and most efficient pumps, valves, and cylinders. With our expert manufacturing capabilities, we produce fully customizable Hydraulic Hot Forming Presses and Forming Presses. By helping our customers develop custom made Hot Presses and Hot Forging Presses, we can best advise them on the specific design best suited for their industrial applications. From there we use the latest manufacturing techniques and quality control procedures to manufacture highly rigid, stable, and accurate Hot Forming Presses.